Following sample descriptions (Annex 16.2 - 16.5) on surveys are derived from an external documentto support surveying procedures with import to Map Maker. Thanks to and with permission of Nick Hopton (UK). 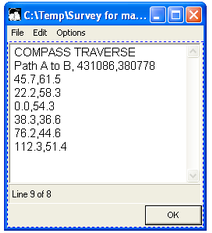 The product of an open compass traverse is always a polyline. The corners of the line may represent points whose positions it is wished to plot, or the polyline may describe the shape of a linear feature. In the example provided the polyline is taken to represent the centerline of a path. Set a marker on the ground at Point A. From Point A take a compass bearing on Point B, then measure the distance between Point A and Point B. From Point B take a compass bearing on Point C, then measure the distance between Point B and Point C. Repeat for the remaining legs of the traverse. Record the results of the survey in a data table similar to that shown above. The bearings shown in the table of survey data are grid bearings. (Magnetic compass bearings must be converted to grid bearings by compensation for local magnetic variation. If magnetic north is west of grid north in the area of survey the variation is deducted from the magnetic bearing. If the magnetic north is east of grid north the variation is added to the magnetic bearing).